The worst part about taking vacation is getting back to mounds of work. Work doesn't take a vacation but should. I am going to do a memo next time! While I was gone several patients were admitted. This is a slower time of the year as we don't have any babies to feed, but accidents continue to happen on a regular basis. 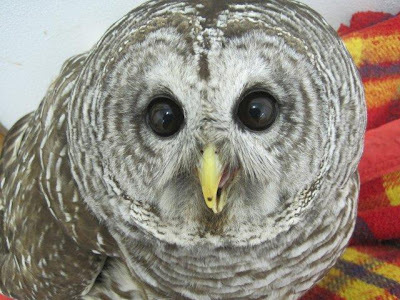 The Barred Owl pictured above was hit by a car near Mosinee. Someone stopped on the highway and put her in their trunk. Imagine their surprise when they got to work, opened the trunk to show co-workers and get help for the owl, and the bird, now conscious, jumped out in the parking lot of FED EX in Mosinee. The Marathon County Sheriff Department called REGI to alert us to the situation. I am grateful to this fine agency. We are located over an hour from the site, and they are excellent about responding to evaluate. They let us know if we need to come out or if they were able to capture the bird and only require transport. Education Director Steve Fisher lives the closest to the site. He got a VERY early morning call to "re-rescue" the owl. Steve wears many hats around here! He never knows when that next phone call will come or what adventure it will bring. The poor Barred Owl was standing but not able to fly and would not have survived had she been left in the parking lot. She had lots of drama in her life that early morning. The exam after admission revealed blood in her mouth and one ear. That indicated a head and chest injury with some bleeding in the lungs. We are delighted to report that not only has she done well but may be coming out of critical care today and start the next phase of her rehabilitation. 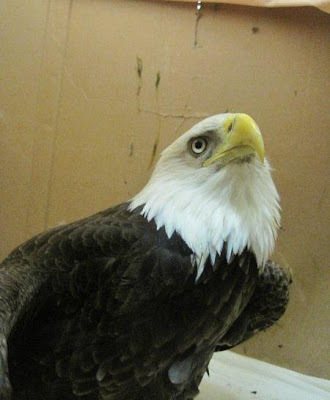 The Bald Eagle hit by a car last week is improving. We had another little "surprise" in his blood work. I will update that in the next blog. In my last blog I commented that wild birds have to be perfect to survive. One reader sent me an email to ask if my comment diminished the need for our work. NO, it surely doesn't. 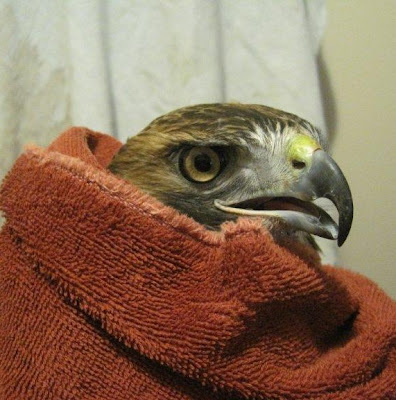 Most of our patients come to REGI through human-caused events: being hit by a car, window collision, illegally shot, poisoned ( usually accidentally when people are trying to kill insects or rodents) and similar situations. A few year ago we saw "illness" in otherwise perfectly healthy birds but that was a rare situation. West Nile Virus, an emerging disease in the U.S. at that time, takes advantage of even the strongest immune system because no natural immunity yet exists. That is one reason we are careful with the likes of Avian Influenza ( A.I. ), for instance, and continue to test for it in target species. The truth is we don't "repair" birds that have what may be "genetic" problems. While we don't get many, there have been some that for whatever reason should not breed in the wild. The chance of weakening the species is simply too great. 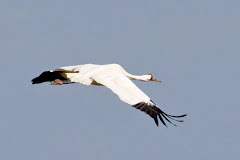 Many of those birds are kept for educational purposes or placed in zoos or wildlife centers.